For the longest time, one of the biggest challenges faced by home businesses was their inability to widen their customer base and reach bigger markets in order to grow and expand. Currently, there are over 12,000 businesses based out of home in Jordan, and for 75% of them, the work they do from home is their only source of income. In Jordan, the government issued new regulations for home-based businesses (HBBs) which made starting a business from home easier than ever. However, one major problem that home businesses still face today is transportation. This issue limits them from accessing bigger markets and reaching customers outside their circle of family and friends. Market analyses by the USAID Local Enterprise Support Project (LENS) revealed a growing demand for authentic, homemade food products among Jordanians, and a real need for a market-driven solution that connects local food producers in more remote or rural communities with customers and businesses that cannot access these products due to lack of transportation. Therefore, in 2016, the USAID LENS funded Ayadi Albalad to facilitate the launch of a first of its kind website in Jordan. Ayadi Albalad, operated by Khodarji.com, is an online platform that helps home-based food producers and small businesses specializing in artisanal foods in local communities outside Amman, reach customers in the capital city. This online platform was established with the goal of ridding people of the difficulties associated with buying authentic, fresh food products, and helping home-businesses in 3 main governorates access bigger markets and increase their revenue. It took almost a full year of testing to come up with a system that works for everyone, and find the most effective transportation and logistics mechanisms for the pick-up and delivery of products. Communication with the home-business owners was one of the main issues that faced the platform in the beginning. Most of the home-businesses that work with Ayadi Albalad are operated by women, who had to check their orders, prepare them and have them ready on time. However, that proved to be unsuccessful because the women are either used to a certain way of work that is unsystematic or sustainable, or do not have regular internet access. After trying a few ways to solve this issue, Ayadi Albalad came up with a solution that works for everyone. It made connections with different associations in its target governorates. These associations act as hubs that communicate with the home business owners when they have orders, allow them to take containers or jars for their products, drop them off when they are ready, and receive their payments. This benefits the home-businesses, the associations and even the drivers of the delivery trucks. Ayadi Al Balad provides containers, jars and all the packaging requirements to the businesses it works with, allowing them to focus on the quality of the products to ensure that they are additive-free, preservative-free, and 100% natural. Since launching in September 2017, around 370 HBBs have signed up to the Ayadi Albalad platform from Karak, Irbid and Zarqa. Over 200 of them have already started selling their products to new customers through the website. “Before working with Ayadi Albalad, I used to make my products without knowing if they were going to sell or not, and that is mainly due to lack of marketing and the resources to do that. Everything changed now, I am focusing on the quality of my food because I know that my products will be marketed and sold through the platform. I am finally making additional income to cover at least part of the costs of my children’s university education, and my products are reaching big markets in areas I never thought I would be able to reach!” – Mrs. Siham Mayaatah, one of the Ayadi AlBalad beneficiaries. 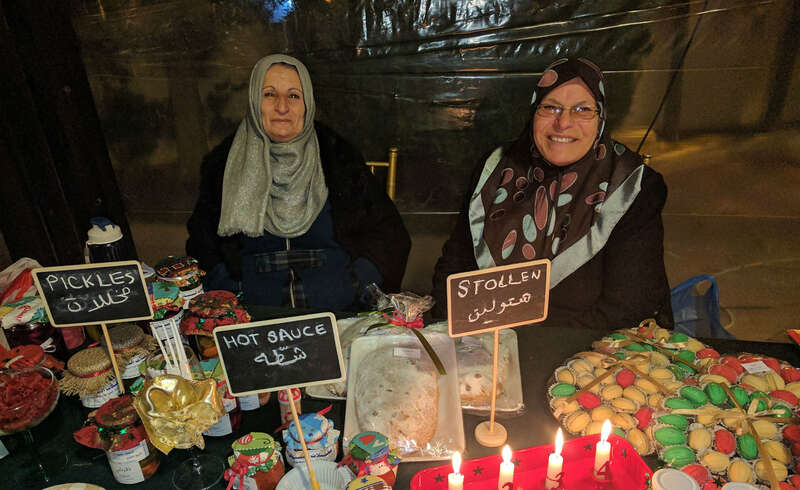 In its efforts to expand the reach of home businesses, Ayadi Albalad is now participating in different farmers' markets around the city of Amman, to market and sell artisinal food products made by the home businesses it works with. USAID LENS is continuing to work with micro and small businesses in Jordan by expanding their reach and connecting them with end markets, in order to increase their revenue and create more job opportunities in local communities.